Cut the tops off the beetroots and then wash them thoroughly. Quarter them and pop them in a baking tray. Pour on some olive oil and add the thyme leaves. Season with salt and pepper and chuck it in the oven until the beetroots are nice and soft. This took about half an hour for us but there was a lot of stuff in our oven. Keep an eye on them. When they are ready, put them in a serving dish and sprinkle feta over the top. DELICIOUS. From Guest Blogger (and S-J’s ladyfriend/babymama), Esther! Slice the onion as finely as you can and place it in a bowl. Add all but a few pinches of the salt, and toss so that the onion is thoroughly coated. Set aside for at least 15 – 20 mins. Place the potatoes in a large saucepan, and cover with cold water. Add the remaining salt to the water. Bring to boil. When the potatoes are tender, remove them from the heat, drain them in a colander, and then run cold water over them to cool them somewhat. Transfer them to a serving bowl. You will notice that your onions look like they have sweated and gotten all wet. The salt has drawn out all the really strong ‘onioniness’ out of them, and left the nice sweet peppery flavour, making them much more pleasurable to eat! Rinse the salt off them (i find the easiest way to do this is to toss them in a sieve under cold running water), and add them to the potatoes. Add the parsley, pickles, mayonnaise, and mustard, and gently toss until all ingredients are combined. You can eat this warm, or chilled – either way is delicious. If you’re not vegetarian, it’s also nice with some fried bacon tossed through. Cook 5(ish) sweet potatoes and mash with butter (your choice of butteryness). Add 1/4 tsp nutmeg, 1 tsp cinnamon and 1/2 cup brown sugar and mix well. Spoon into a baking dish and bake at 180C for 30 minutes. 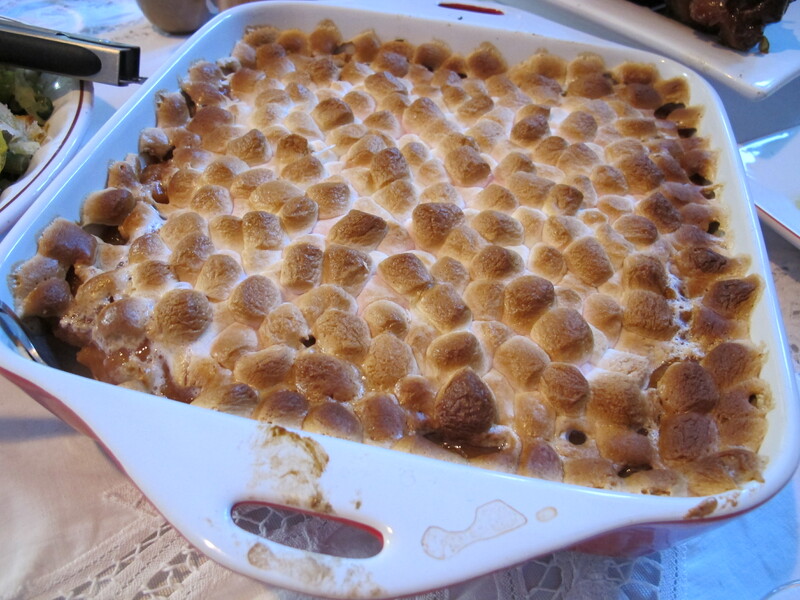 Cover with minimarshmallows and bake until they are melty and brown (approx. 5-10 minutes). Wash zucchini. Marvel at it’s ginormousness! Dice into about 1 inch pieces. Heat olive oil in a large fry pan. Mince garlic into pan. Turn on heat, crank to high. 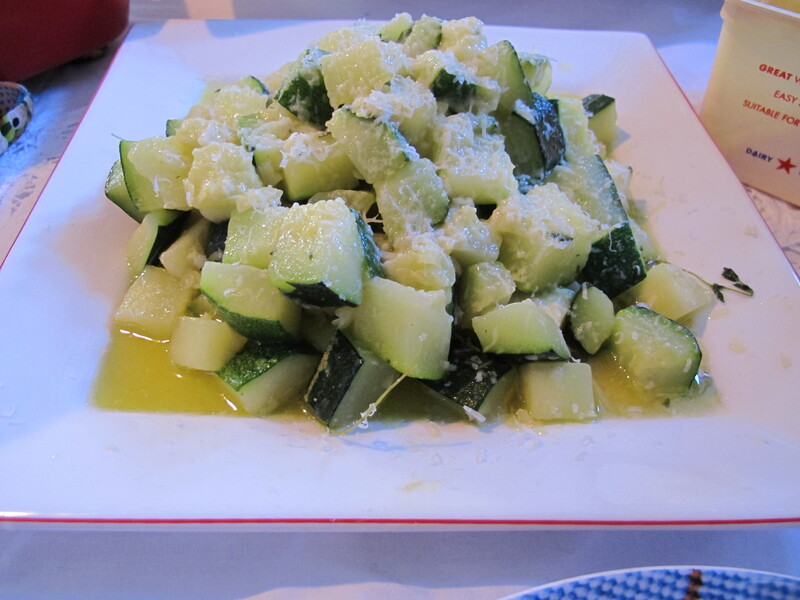 Once the garlic starts bubbling, throw in all the zucchini. Season well with S+P, add the thyme stalks. Resist turning until the edges start to brown. Gently toss occassionally until all delicious pieces are lightly browned and tender. Remove from heat and heap onto your serving dish, removing the thyme stalks as you go. Finely grate parmesan over the top, and serve. This dish is an amalgamation of a few of my favourite things. 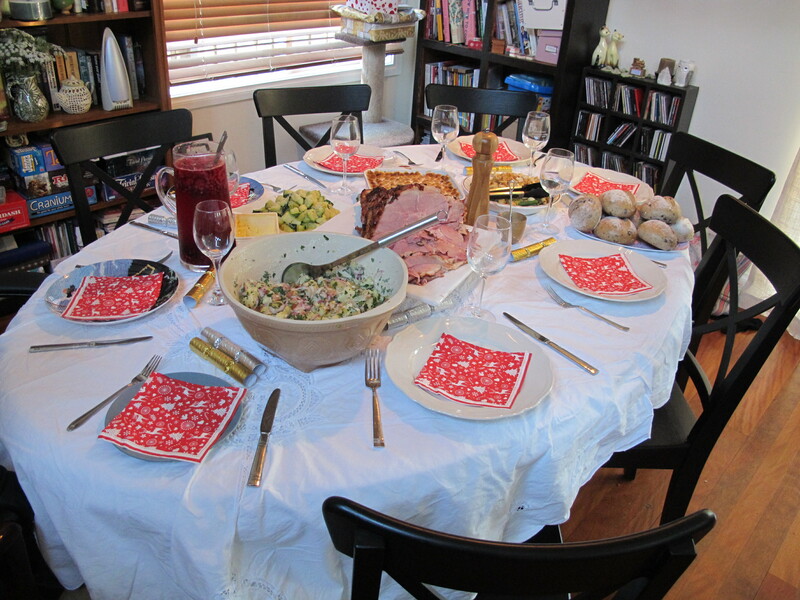 That seemed right for a Christmas dinner that involved a few of my favourite people. I find that the tartness of the molasses and the leeks with the beans makes this an excellent side for a rich meat like ham, or with a creamy chicken dish. Fill a large pot with water and heat over high flame. While the water is coming to a boil, wash the beans and remove the ends – leaving the beans whole (or chopping into 1 inch pieces if you prefer). Add beans to the boiling water and allow to cook for 3 – 4 minutes. The beans should still have a nice crunch to them as you will be heating them again when ready to serve. Drain the beans into a colander, fill the pot with cold water and blanch them in the water, replacing the warm water with cold water until the beans are cool. Drain and set aside. Remove the crusts from the bread and slice into 1 cm cubes. Into an oven tray, drizzle 3 tbsps of olive oil, the whole garlic cloves, loads of salt and pepper, and cubes of bread. Toss to coat. Bake in oven until golden brown, approximately 5 – 10 minutes. Remove the tops and bottom of the leek. and outer layer, then wash well under cold water to remove any dirt trapped in the layers. Slice in half lengthways and then slice into thin half-moons. In a medium frying pan, add 2 tbsps olive oil, the remaining garlic cloves, and the sliced leeks. Saute over a medium heat until the leeks are softened. Raise heat and add the white wine. Cook until wine is reduced and syrupy. Add honey, stir together and remove from heat. In a heat proof serving dish add the beans, cover with the leeks, then the croutons, drizzle the pomegranate molasses over the top. Set aside until ready to serve, reheat 5 – 10 minutes in the oven. *** We will never stop to clean drips and spills off a serving dish just to take a photo, clearly. Just keeping it real here at NFL. oh my goodness. I am very very jealous of both the food and the company! The Beans! The Beetroot! The craziness that is candied sweet potatoes! going to have to try some of these out CLEARLY!